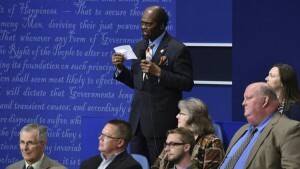 Washington, Oct. 10 – For last night night’s town hall style debate, ABC and CNN welcomed questions submitted via the Open Debate Coalition’s portal. All of the top 30 questions that moderators promised to consider received more than 20,000 votes, and an important disability rights question had nearly 12,000 votes. Yet none of the 30 – or the disability-related question, which was #52 of thousands – were asked, leaving the disability community lacking for information. 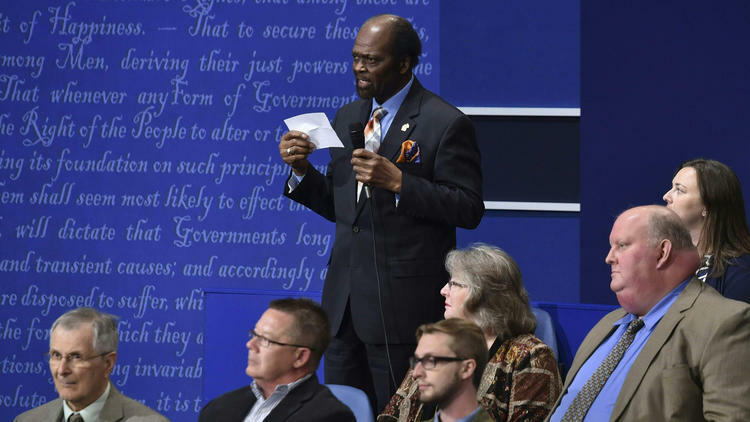 James Carter, an undecided African American voter from Missouri, asked a question that opened the door for both candidates to include people with disabilities, a minority group that represents one-in-five Americans. “Do you believe you can be a devoted president to all the people in the United States?” Carter asked. “And I’ll be a president that will turn our inner cities around… African-Americans, the inner cities, [it’s] devastating what’s happened to our inner cities,” Trump said. Hillary Clinton, who responded second, took a different approach. She referenced her work with the Children’s Defense Fund, where she helped people of color and people with disabilities get an education. Clinton included people with disabilities three times during her debate responses. The other two references were made in the context of people Trump has ridiculed. “He has also targeted immigrants, African Americans, Latinos, people with disabilities, POWs, Muslims, and so many others,” Clinton said at the beginning of the debate. RespectAbility has asked Trump and his campaign to complete the #PwDsVote Disability Questionnaire on multiple occasions, beginning in January. While his campaign initially responded they would do so following the New Hampshire primary, and then after clinching the nomination, they have yet to do so. In July, the Alliance Center for Independence and REV UP NJ held a call-in day to encourage Trump to respond. More recently, The American Association of People with Disabilities and the National Council on Independent Living sent his campaign the REV UP questionnaire, another nonpartisan disability questionnaire, which he also has yet to complete. Clinton has responded to both questionnaires. The political conversation is not only focused on the presidential election, as attention is shifting to who will control the Senate, which the Republicans currently control. FiveThirtyEight projects that the Democrats have an opportunity to take control this year. If the Democrats flip the Senate, then Sen. Schumer, who introduced the Disability Integration Act, would be in charge. As such, RespectAbility has reached out to candidates running for Senate as well as Governor in the 2016 elections with the #PwDsVote Disability Campaign Questionnaire for Senate and Gubernatorial Candidates for people with disabilities. Twenty-three candidates for Senate, as well as nine candidates for governor, from both sides of the aisle (19 Democrats, 13 Republicans) have responded so far, showing that disability rights is a nonpartisan issue. The responses also are geographically-diverse, coming from states all around the country. Just as Clinton has made this a part of her campaign, Republican Sen. Richard Burr in North Carolina also has made it central to his re-election effort, highlighting his work in support of the bi-partisan Achieving a Better Life Experience (ABLE) Act. This new law, which also was supported by Maryland Democratic Rep. Chris Van Hollen, creates new savings accounts for individuals with disabilities in order to pay for qualified disability expenses. Key Senate race outcomes could be changed by outreach to the disability community, including the races in Maryland, North Carolina and Wisconsin, where at least one candidate in the race has enacted legislation that has positively impacted people with disabilities. Below are links to detailed answers to the questionnaire. RespectAbility and TheRespectAbilityReport are nonpartisan and do not endorse candidates. The questionnaire is purely for educational purposes.